Google has announced the rollout of Android Lollipop 5.0 for the Nexus series of Smartphones and also for Tablets. So many smartphone users start buying the Nexus Phones because of Google Updates. Google told that these Nexus phones are the first phones which will get the Google Updates. So the crazy of Nexus phones in the present trending is reaching the sky. So today I am here with a tutorial on “ How to Update for Android Lollipop 5.0 very easily“. For people who can’t wait for the Update for Android 5.0, then there’s a quick tutorial to get Android 5.0 Lollipop on Google Nexus 4, Google Nexus 5, Google Nexus 7 (Wi-Fi), Google Nexus 7 (2013) Wi-Fi, Google Nexus 9 (Wi-Fi), and Google Nexus 10, amongst other devices. You can update to the latest Android OS to your Nexus device using a factory image.If your phone is not a Nexus phone then you can check here for an Android Lollipop update for your SmartPhone . Before going to the tutorial I warned you that ” you are doing this at your own risk”. If something happens in the middle and miss the total data. So before starting you must take the Backup of your total Data. Now let’s go into the tutorial without wasting the time. You may get the Android Lollipop Launcher for free for any smartphone. You can download and use this launcher for free. Click the download button to download the Launcher. Here is how to manually download and install the Lollipop version on your smartphones and on Nexus phones. 1) First of all Download and Install the Latest Android SDK on your windows computer. 2) Now you should ADD the SDK folder to the path by the below-shown steps. Open the Properties of My computer.(ie. Right click on the My Computer and then click on Properties). Now Select the Advanced System Settings. Then click on ..>>System Properties..>>Advanced..>>Environment Variables. A window appear then now selectPath and click on Edit, and then now type in the name of the directory where you installed the SDK, and you should separate each entry by a semi-colon. 3) Now you should enable USB debugging on your device. 4) Now go to ..>>Settings..>>About Phone..>>Software Information. 5) Tap now the Build Number for Seven Times. 6) Then go to ..>>Settings..>>Developer Option and then tick on for USB debugging. 7) From here Download the correct Factory Image of your Device. 8) Next is to extract the Image file on your computer or laptop. 9) Now you should the device to the computer using the USB. 10) Start the device in Fast Boot Mode. 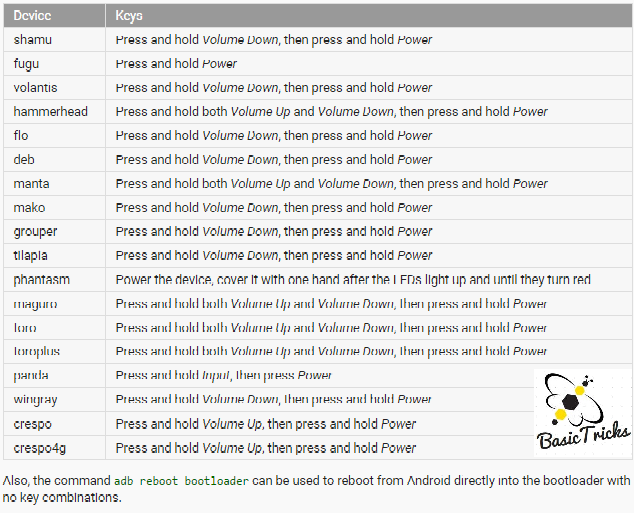 The easiest ways to start device in Fast boot mode list for different mobiles is given below Or you may have a clear b clicking Here. Open the Command terminal and then navigate to the unzipped system Image directory. When have done, then Google recommends that you lock the bootloader for security. You can do this by booting the device in fastboot mode while still connected via USB, and using the command terminal to execute: fastboot oem lock. This is how you can update to Android 5.0 Lollipop version on your smartphones and Nexus phones. How to Increase Ram on Android Phones. I hope that this article “Android 5.0 Lollipop free download and Update to Android lollipop 5.0” will help you to update your mobile very easily. Like us and Like the post. Don’t forget to share the post with your friends and make their update easy. Feel free to share your problems with us we will try to resolve the problem faster. Lava iris x1 atom ma lollipopl update kasa kara? How to install andriod lollipop?? ?